Authorize the County Attorney's Office to Schedule and Advertise a Public Hearing for May 2, 2018 at 10:00 AM, for the purpose of adopting an ordinance to amend the County Charter to require that amendments to the charter be effective upon approval by a 60% vote of the electors. Other than the cost to publish required legal notices, adoption of this Ordinance will have no impact on the FY 18 Adopted Budget. At the last Hillsborough County BOCC meeting on April 4, 2018, Commissioner Miller put an item on the agenda asking for a draft ordinance proposing a Charter amendment that future Charter amendments require 60% super majority to pass. The original motion at that meeting by Miller excluded citizen-led initiatives which would remain at 50%. The motion was amended that ALL charter amendments require 60% super majority. That amendment passed with Kemp, Miller and Hagan voting NO and Murman, White, Crist and Higginbotham voting YES. Miller's proposed charter amendment ordinance was coincidentally made at the same last BOCC meeting that Commissioner Higginbotham placed an item on the agenda proposing the 5 Constitutionals elected positions be changed to non-partisan. Higginbotham's proposal was rejected 4-3 with White, Kemp, Crist and Miller voting NO and Hagan, Murman and Higginbotham voting YES. All citizens who showed up to make a public comment on this item were opposed to this proposal. No one showed up to speak in favor of it. And coincidentally at the same last BOCC meeting, Commissioner Pat Kemp put a proposed term limit item on the agenda. She proposed a change to the Charter that county commissioner terms be limited to no more than ten consecutive years of service. Commissioner Sandy Murman subsequently tried to make an amendment to Kemp's proposal to include changing the Charter from the current 4 single and 3 countywide districts to 7 or 9 single districts. That motion died for lack of a second but Murman said she would bring it back at a future time. Kemp's original motion asking for language for an ordinance to change the Charter for 10 year term limits was watered down to directing staff to bring back to the next Board meeting a report reviewing all possibilities, including 10, 12, and 18 year term limits; the impact on current Board member terms; and Board members serving in single-member and Countywide districts. Read the transcript of the commissioners discussion on this agenda item here. A lot of self preservation was on display. The County Attorney then said any term limit changes would reset the clock. Really? It is mid April with the mid term election just over 6 months away and this commission is now proposing some major changes to the County Charter for the November ballot. If all these changes are so important, where have these commissioners been - since the last election in 2016? 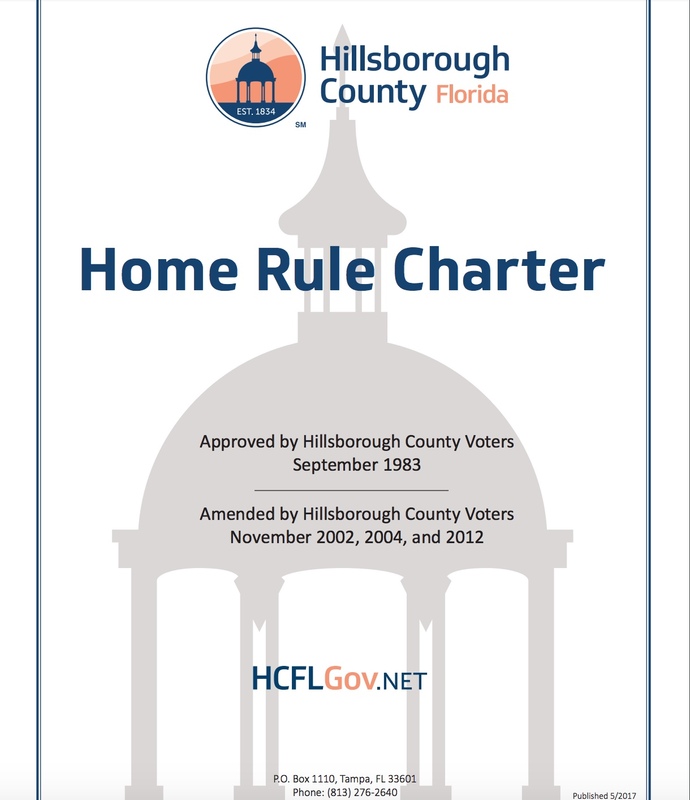 The Hillsborough County Charter was approved by voters in 1983. In 35 years only a handful of charter amendments passed in 2002, 2004, 2012. That is quite different from the abuse that has occurred using Amendments to the State Constitution that should have been passed by legislation instead of being codified in the State Constitution. We all can recall the pregnant pigs amendment in 2002. The class room size amendment passed in 2002 52-48% BEFORE the 60% super majority amendment was passed 58-42% in 2006. The repeal of the classroom size amendment failed 55-45 in 2010 AFTER the 60% super majority was in place even though more voters voted to repeal it than initially approved it. Though there are these instances, we believe the 60% super majority required for State Amendments is good. Is a 60% super majority for all county charter amendments good or necessary? Some of the County Charter changes were housekeeping items. It takes a super majority of 5 commissioners to put a Charter amendment ordinance on the ballot - unlike tax hike referendums that only need a simple majority of 4 to get on the ballot. A question asked at the April 4th meeting is whether this charter amendment would affect any other referendum that could go before voters. The County Attorney responded that this proposal only affects amendments to the Charter not referendums that state statute has authorized. 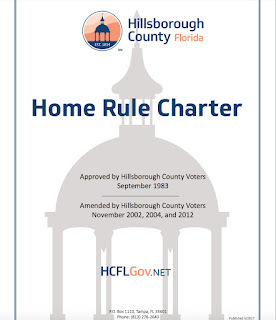 The problem in Hillsborough County is not with Charter amendments but with unnecessary sales tax hike referendums. Tax hike, revenue raising referendums should require a 60%. This would help reign in pursuing unnecessary sales tax hikes as the primary go to means advocated for by special interests that benefit them. This would help force more fiscal due diligence within existing budgets, especially as revenues are naturally increasing due to growth and rising property values. Unfortunately, it was very noticeable that almost all the county commissioners do not want super majorities required for tax hikes. The State can fix that problem The State needs to change Florida Statute 212.055 that authorizes discretionary sales surtaxes to require approval by 60% super majority of the electors in the county. Yes - the process to put a proposed 60% super majority for all county Charter Amendments can be met even at this late date for ballot initiatives to be approved by August to be on the November ballot. We are already anticipating the state Constitution Revision Commission putting numerous State Amendments on the November ballot that may create enough chaos and confusion. But are all these proposals political expediency? Something smells a bit when these proposals for major charter amendments suddenly appear at the same BOCC meeting this late in an election cycle. Four county commission seats have races in November and four incumbent county commissioners have filed to run again. But the commission may change with new members after November. If the proposed amendments are so good, are needed, or are necessary, pursue them for the 2020 ballot during a Presidential election year when the most local voters turn out. The county commissioners should not be playing politics or pursuing self preservation with the County Charter.